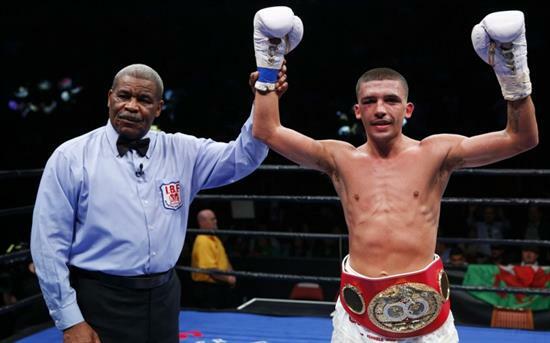 GLENDALE, Ariz. – Lee Selby got what he needed in his introduction to the U.S. market. The Welshman said hello to America with a victory, a unanimous decision, over Fernando Montiel Wednesday in the first defense of his IBF featherweight title in an ESPN-televised bout on a Premier Boxing Champions card at Gila River Arena. It was the beginning of what he says is a campaign to heighten his profile in the U.S. market. A better-known Selby, he says, leads to bigger fights. At the end of the road, he hopes for a shot at Leo Santa Cruz, the best and the brightest on Al Haymon’s 126-pound roster. But, first, Selby (22-1, 8 knockouts) had to get past Montiel (54-5-2, 39 KOs). It wasn’t easy or as one-sided as the 119-109, 118-110, 116-112 scorecards indicated. Montiel bloodied him above his right eye. The Mexican rocked him repeatedly with counters that appeared to land with more power than he had in any of his punches. “I thought it was a lot closer fight than the judges had it on the scorecard,” Montiel said. “I spent the first few rounds waiting for him to come at me so I could counterpunch. But he wasn’t engaging me so I became the aggressor and brought the fight to him. The 5-foot-9 Selby, booed by a Mexican and Mexican-American crowd, had a big advantage in reach and he used it from the beginning with a long, quick jab against 5-4 Montiel. Selby’s superior size was challenge enough for Montiel, an accomplished tactician with world titles in three weight classes already on his well-traveled resume. Montiel’s task was further complicated by Selby’s footwork. From round-to-round, he moved side-to-side, gold tassels dancing off the top of his white shoes with every step. From long range, Selby scored with jabs and a mix of rights. But Selby’s right hand possessed none of his jab’s consistency and precision. It often missed, giving Montiel his best – and perhaps only – opportunity. In the early moments, it was clear that Montiel had prepared for it. Selby missed and Montiel landed with a quick counter in the closing seconds of the first round. In the fourth round and again in the sixth, Montiel moved stubbornly forward and threw a succession of accurate counters, especially with the left hand. By the sixth, blood began to drip from a wound near Selby’s right eye. For about a round, he appeared to be bothered by the cut. But Selby recovered, went back to his jab and – in the end – ensured that his American hello did not turn into a quick goodbye. The post Lee Selby outpoints Fernando Montiel in successful U.S. debut appeared first on Ring TV.